Not my backyard. More like backyard to the city of Las Vegas. But close enough that I refer to it as my backyard, and a favorite spot to get out and take photos, even if I don’t manage to get very far from the car. Earlier this month I had a morning that I was able to get away. A storm had dusted the higher elevations with some snow, and as I waited for the sunrise to give the cliffs a red glow, I watched the clouds dropping onto the cliffs behind me and moving in. Approaching sunrise at Red Rock Canyon, Nevada. Photo by Steve Bruno. After I took the above shot, I was feeling many semi-frozen drops of water, so I headed down the road a short stretch, in between bands of lowering clouds. I missed one very exquisite lighting opportunity, as the slush drops started hitting the ground before I could get to my location. That brief bit of weather passed, and it remained mostly dry long enough for me to find a couple more settings for photos. I then returned to where I started the morning, as the clouds seemed to have hit a barrier there, and just lingered on the cliffs without lowering any further. 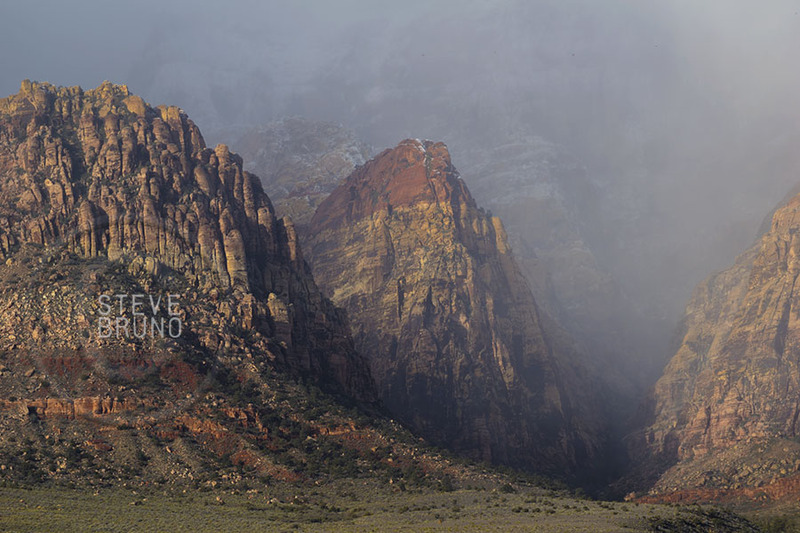 Clouds drop their moisture as a little bit of sunlight streams through on Red Rock Canyon Nevada. Photo by Steve Bruno. 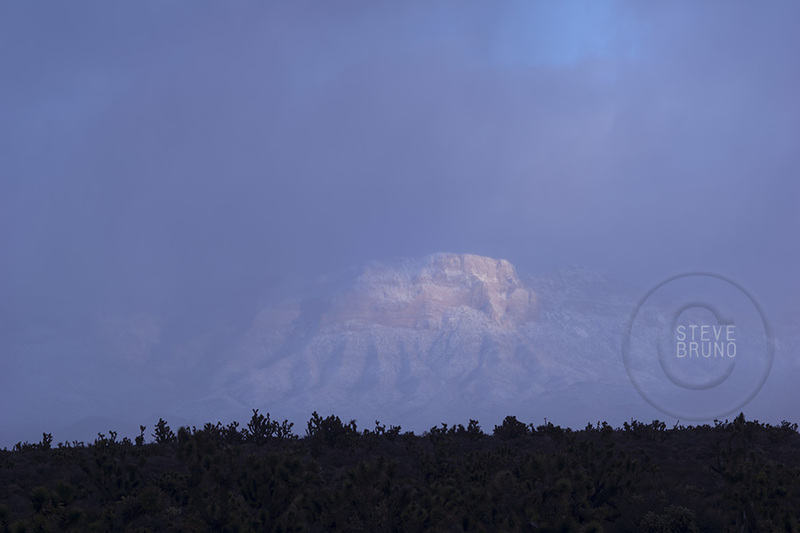 One window in the clouds allows a burst of sunlight to hit the snow dusted mountains of Red Rock Canyon, Nevada. Photo by Steve Bruno. Sun lights the lower cliffs as clouds still linger in the higher cliffs of Red Rock Canyon, Nevada. Photo by Steve Bruno. Our backyard is welcoming all right! Beautiful!